2019 Update: We’ve taken a look at the newest products available to give you an up to date rundown of the best car jacks out there. Some of you might be wondering why a site geared towards security is looking at car jacks, but by definition, security goes beyond keeping unauthorized hands away from your property. Personal safety is just as important, and car jacks play into that in two ways. First, keeping your car in good maintenance reduces accident risk on the road, while a good quality jack reduces the risk of accidents during maintenance. A car fallen to disrepair is a massive risk, and thus giving you the ability to fix things up whenever needed, or simply facilitating a tire change, has more to do with “security” than you’d first think. Car jacks are one of those tools which really ought to be in every garage, but far far too many are without one – or a good one. 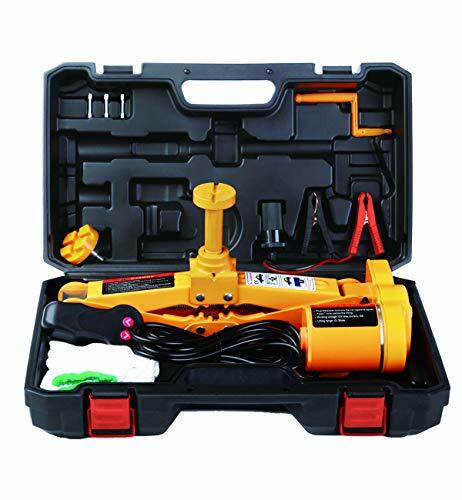 Getting under a car to do maintenance or tweaking, or lifting one side up ever so slightly to change the wheel isn’t something easily done without a car jack, making these handy tools cornerstone devices for effective home car maintenance. Sure, you could just drive down to the nearest mechanic, but given the time and knowledge, maintaining your own vehicle is both satisfying and cost-effective – provided you don’t mess something up. Car jacks come in various forms and types. The can be categorized based on the method of operation, shape and strength. Some are electric and allow a small motor to do the lifting, some are hydraulic, while some are entirely manual and rely on your brute strength to get the car in the air, while the jack simply keeps it there. In terms of shape, you have scissor jacks, trolley jacks and jack stands, as well as some highly specified other variants out there. Finally, when it comes to strength, you’ll need to keep an eye out for weight limits, as a jack capable of lifting a small car may not be able to handle a bus, truck or even a larger SUV. A jack breaking while you’re under the vehicle can lead to serious injury or death. Quality is also a major factor. It’s one thing that the product has a particular weight limit written on it, but you need to be sure the jack is actually well made and sturdy, not to mention tough and capable of serving its purpose for a long time. It depends on how low set your car is, but a jack breaking while you’re below it can be fatal, which is why sub-par quality just won’t do. At the same time, comparing price with the value of what you’re getting is important – but then this is something you need to pay attention to with everything you buy. In the case of car jacks, you’ll likely be looking at a full price spread of $20 to $120, with fairly even distribution across the whole scale. We’ve looked at a wide selection of car jacks at multiple price points to help prospective buyers picking whichever model works best for them and their needs. We’ve covered models of different types and form factors as well. You can read our thoughts on the best and most popular items below. 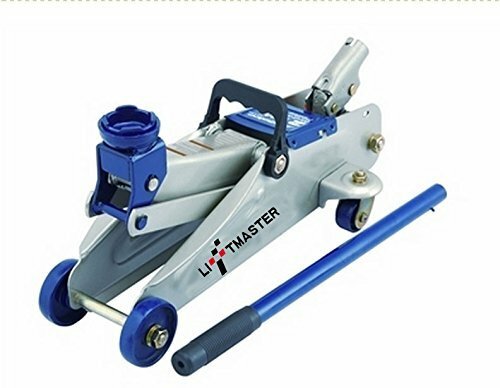 The Pro-Lift F-767 is yet another hydraulic trolley floor jack, but this time we’re looking at a product that gets things right. The basic method of operation isn’t anything to write home about, it’s still your standard lever-crank with hydraulic assist to lift the arm up on one side, but it’s the additional features were this model shines. The F-767 features a bypass device in it to prevent oper-pumping and over-extension, thus reducing internal structural stress and hydraulic pressure. It will also generally increase the life-span of the tool. Cranking the jack beyond its intended extension will cause the whole assembly to tense up, increasing the risk of it breaking, however the F-767 prevents this by “unhooking” the arm from the crank system when it reaches maximum extension. This model also comes with a valve for overload protection, which in essence is the same thing as Torin’s safety overload system. That coupled with the bypass device and an extremely sturdy build results in one of the most stable and safe jacks we’ve looked at for this guide. The weight capacity of the F-767 is 2 tons, and the extension range is 3-1/2 inches to 14 inches. It has a profile that is comfortably low enough to fit under just about any car that isn’t a lowrider, and the carry handle and swivel saddle for easy repositioning. After the past two products we’ve looked at, it’s important to note that this model didn’t get a slew of negative reports about breaking or malfunctioning, so buying the F-767 seems like a safe bet. 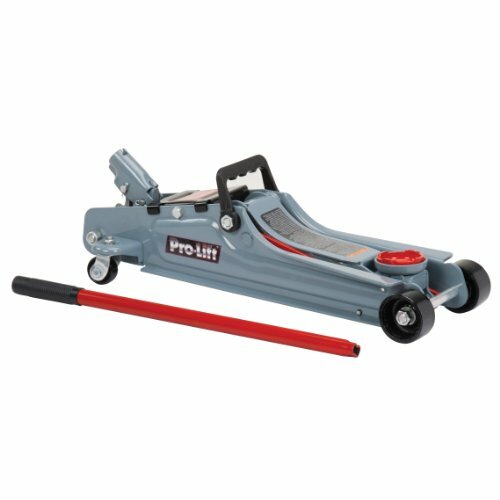 The Pro-Lift F-767 is our favorite from this selection because it brings genuinely useful features and high quality to a decent and affordable mid-range price point without any real drawbacks. Going higher in price will get you snazzier models, but usually the increase in cost does not reflect an increase in quality. This is definitely the best model in terms of value. Blending quality, strength and a bunch of safety features, you can’t go wrong with the Pro-Lift F-767. Really, the only scenario in which we’d recommend buying a different model is if you specifically need something with a higher weight capacity. We’re doing a bit of a leap in terms of price with this next model, and looking at a jack with a new method of operation altogether. This scissors type jack is fully automatic, as a small electrical motor does the lifting. This isn’t a hydraulic jack where, assisted by pumps, you still do the cranking, but a fully electric one which lifts your car at the press of a button, provided there is a socket nearby. Being as small as it is, the motor’s output isn’t colossal, and thus under maximum weight, it takes 2 minutes to extend fully, while a human working a hydraulic jack can extend it in a few seconds. This is the payoff for not having to do any hard work. Naturally, the main feature of this jack is the electric motor, which takes over the heavy lifting from the user. The motor can be plugged into any 12v outlet for power, or lacking such a socket, can be powered by the car battery with a jumper cable included in the package. The ROGTZ Electric jack kit contains a ton of little extras and bonuses, justifying the high price point. Included are the jack itself, a high neck attachment for SUVs, a car battery adapter, a 12v plug, a small tool used to swap out the connections and the neck, as well as some snazzy working gloves. The device has a built-in light to assist with work done at night. The electric motor adds heft and further stability to the device, while also greatly increasing its size and weight. This can be an issue when needing clearance to fit under low-set vehicles and when it comes to storage, but is a bonus when it comes to a functional point of view, as this thing is nearly as stable as a jack stand. The high price of this product is what kept us from naming it number one, however we feel the number of features and goodies included justify that price – nonetheless, dropping this amount of cash for a gimmick, no matter how practical, isn’t going to be our top recommendation. Get Done in Minutes: It takes ONLY about 2 minutes to reach a maximum height (42cm) with loading capacity as high as 3T. Whether men or women can replace the tire with ease in any emergent case. Pittsburgh Automotive’s 3 ton floor jack fits the niche for really low profile jacks. This caters to prospective buyers who either have a really low-set vehicle, or not a lot of storage space to fit their jacks. Keep in mind that being low set also makes the extension height of the arm relatively low compared to other jacks, so if you’re looking at this due to storage concerns, make sure your car isn’t set too high for it to be effective. As mentioned above, the main reason anyone would be looking at this model is due to the low profile of it, allowing clearance below low-suspension cars. The jack’s dimensions are 28 x 12 x 10 inches, so it can fit into really small gaps as well. This model comes with a comfortably long handle, and the saddle pad swivels a full 360 degrees allowing for ease of access. Due to the low profile, the arm extension is bound to be lower than on other models, ranging from 2-7/8″ to 19-3/4″. Pittsburgh AUtomotive’s rapid-pump tech includes two hydraulic parallel pumps allowing you to crank the jack up to maximum height in just 3 pumps. 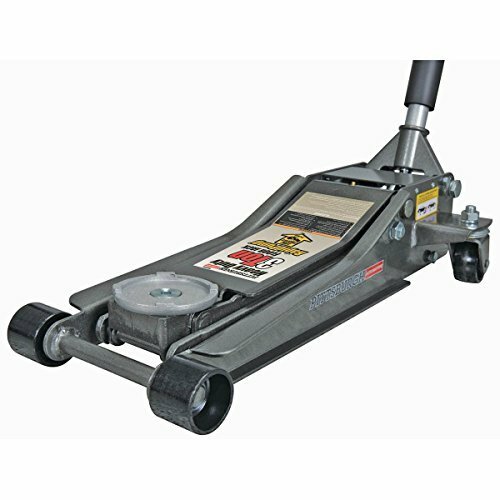 There isn’t much wrong with the Pittsburgh Automotive 3 Ton Heavy Duty Ultra Low Profile Steel Floor Jack. However it doesn’t hit our #1 spot is because of two reasons – firstly, it’s use is highly specialized, and second, other models pack more features at a lower price point. 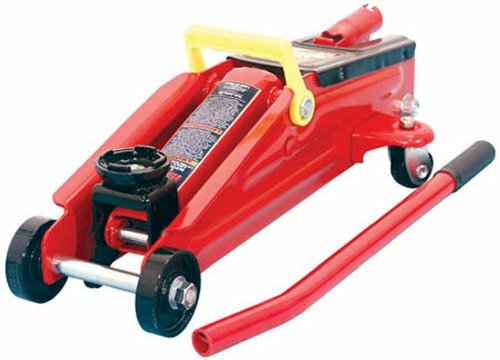 Moving on to yet another type of jack, we have the trolley jack, which when closed has a very low profile. The arm of this type of jack extends upwards on one side from a center pivot, and is cranked up with a lever on the other side. This is the most common type of jack, as it offers the most mechanical assistance in lifting. On that note, this model also features hydraulics to further help in lifting up the car. Trolley jacks, due to their shape, are less stable than scissors or stands, so you’ll need to pay attention to the placement of the jack to prevent it from tipping in the direction of the arm. Some jacks try to help in this regard with wheel locks, however this model does not feature them. You really should know what you are doing with these, as a car falling on you is potentially fatal. The Torin trolley floor jack features a safety overload system, as the manufacturer calls it, to prevent the use of the jack on vehicles that weigh more than this model’s capacity (2 tons). Basically, as you’re cranking up the jack, a small mechanism will automatically disengage if the weight of the object exceeds the limit, causing the arm to descend. The benefit of this is that you’ll know you’re overloading it beforehand, instead of thinking everything is dandy and have the jack break while you’re under the car. This model has a few nice features which are a welcome sight at this price point. The large circular saddle can swivel a full 360 degrees, and if you combine this with the orbit wheels and angled handle, the Torin trolley floor jack can be used from basically any direction, allowing you to easily get it into place, and even move the position of the body while something is jacked up (though we don’t recommend this). The jack is very sturdy, built out of heavy duty steel and has quite some heft to it – luckily there is a carrying handle on it to make it more manageable. The model packs some great features at a low price, but looking at user comments online will answer why – the cost was seemingly cut on quality. This model has one of the worst reputations for breaking or malfunctioning. Also, the safety overload system can sometimes engage all the time, meaning the jack can’t hold up anything and the arm will just drift back to a closed position. We really wanted to like the Torin Big Red Trolley Floor Jack, as it has a nice lineup of features, and the safety overload system sounded like a great thing to have. However the large number of reports that it breaks under pressure keep us from recommending this product. Torin is a name you’ll encounter a lot when looking for jacks, and they manufacture models ranging widely in terms of type. Jack stands are pretty unique compared to other jacks, and they’re best suited for use with vehicles that have a high suspension, as even at the lowest setting the shape of the jack stands sees them stand tall from the ground, so low-set vehicles would need a pre-jacking to even fit these under them. The benefit of jack stands is vastly superior stability and strength to other kinds of jacks, thanks to the force of physics alone. These stands are a sure bet, and are possibly the most reliable jack variant out there, even if their use is somewhat limited by their shape. The Torin units are fully manual, but have internal mechanisms to provide some mechanical assistance. The main feature of the jack stands is without a doubt their stability and sturdiness. By the nature of their shapes, other jacks may topple or buckle more easily than these stands. Their pyramid-like shape distributes weight evenly and the construction of the legs provide maximum firmness. The jack is made out of high durability welded steel, with the base being a single piece, so you don’t need to worry about it coming apart. The subject of this particular review is the 2 ton variant, however this model comes in 3, 6 and 12 ton variants as well, with appropriate price increases. In all cases, the large concave saddle surface of the arm ensures that the car won’t shift off the jack and fall. The extension range of the arm is 10-13/16″ to 16-1/2″ and is operated with a manual crank. It’s a self-locking mechanism, which when not unlocked is mono-directional to assist with lifting. Strangely, there are some reports that the product apparently arrived with a rusted crank that broke off easily, so you might want to check for corrosion before you actually put a car on it. 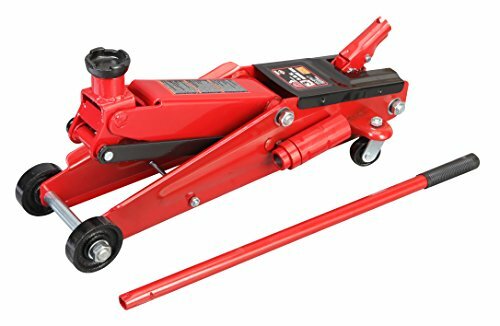 One more great aspect about this product though, is that your get a pair of jack stands for this price, meaning it’s more economic a choice than even the T10152. The Torin Big Red Jack Stand is a highly specialized product, which, if it fits your needs, can be a fantastic choice. But if your vehicle simply isn’t compatible, then no measure of positive aspects will make this the right jack for you. Large saddle surface area for better contact with the load being supported; Large foot base size of 7.08" by 6.29"
Torin is opting for a cinematic naming scheme here, making their next model sound like a sequel or something. Compared to their other models, the SUV model is more sturdy and heavily built and has a so called long neck, meaning the side of the frame on which the arm rests extends beyond the length of the arm in order to provide a greater measure of stability, which is crucial when dealing with large SUVs. The main feature of this particular jack has to be its endurance and sturdiness, which are crucial for its purpose. SUVs are bulky, heavy and pretty tall, all of which make them a tricky vehicle to lift and keep lifted, which is why regular old jacks might not do the trip even if they meet the weight requirements. The subtle changes in shaping and structure of this model makes it ideally suited for this task. As an SUV jack, the extension range of this model is higher than that of other jacks in general, ranging from 6″ to 21″, making this the highest-reaching model we’ve looked at in this guide. It also has the sturdiest saddle which is naturally high-set with a small neck to help with lifting SUVs. For the sake of stability, the saddle itself doesn’t swivel, however the casters do. The model is equipped with a welded holder for the crank bar, though there is no carrying handle which, due to the heft of the model, makes moving it around a tad difficult. The Torin SUV jack isn’t bad in any sense, however it lacks the features that would justify the price point. If you own an SUV or a small truck, this may still be the way to go simply because the other models won’t be suitable, but if you’re not in need, we’d pick a different one. The first model is a scissor jack, working on the principle of moving the fulcrum points of four steel shafts closer together to produce upwards motion. The T10152 is fully manual with a handheld tool used to twist the central screw opening and closing the jack. The entire thing is made out of heavy duty steel and weighs a good amount with a wide base and large saddle to make sure it doesn’t topple under pressure. With a manual jack like this you’ve got no mechanical assistance with getting the car off the ground, so unless you feel confident that the T10152’s little handle and your strength is enough, this isn’t going to be the best choice, and this brings us to the first issue – even if your strength is sufficient, sometimes the handle isn’t, with some reports of it bending and breaking rather than opening the jack. The Torin T10152 stands out as a budget purchase with a very low price – some places serve coffee that costs more than this thing (granted, amorally expensive places, but still). It still does its job, but at a budget. 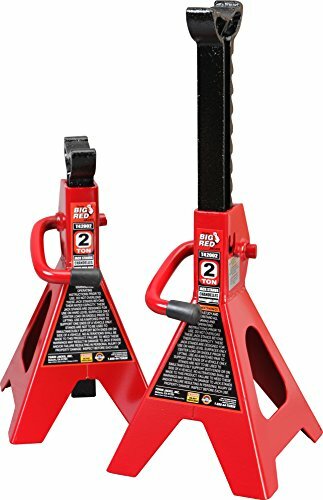 If you need several of these because you run a repair shop, or need a quick solution or replacement for a broken jack and know you have the strength needed to work it, it’s a great choice that doesn’t chew into your wallet. The weight limit for this model is 1.5 tonnes, which is fairly low and will only be suitable for smaller and mid-sized personal vehicles, though some reports state that it’s a good solution for trailer homes as well. Though the product claims that its “small size” allows for “easy storage”, it’s a large and stable build with a wide base as mentioned before, meaning it will likely be too big to fit generic jack compartments. You decide whether this is a positive or a negative aspect – stability versus storage? The height can be adjusted to stand between 3-3/4 inches and 15-3/8 inches. Some might think this goes without saying, but before using it you should treat the central screw with a bit of grease to make sure it doesn’t give you a hard time when crancking, as without lubricant it can get really stiff, especially under weight. 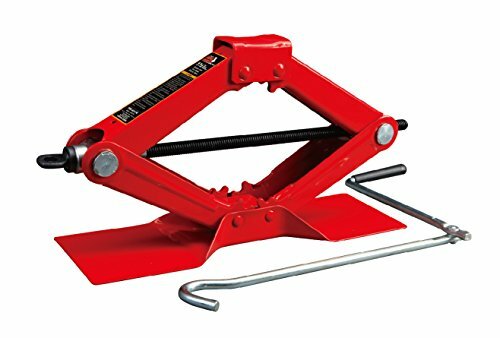 The Torin Big Red T10152 Steel Scissor Jack is definitely a competent product which accomplishes what it sets out to do without demanding an arm and a leg in exchange. While it’s pretty bare bones, being a manual jack with a low weight tolerance, it’s of a high quality and strong materials. It’s not for everyone, and there are some gripes to be had, but you could do worse. Stepping away from Torin for a moment, we’ll look at Liftmaster’s take on the hydraulic trolley floor jack. It’s almost identical to Torin’s version with a few small differences, so we’ll focus on what’s different as opposed to reiterating the aspects that are shared. It… doesn’t really have one. The most noteworthy element of this particular model is the swivel saddle which rotates a full 360 degrees, but that isn’t exactly rare, so this more highlights how feature-bare the model is as opposed to highlighting a strength. The Liftmaster jack has fewer features than the Torin model, but comes at a higher price point. It has a weight limit of 2 tons and a lift range of 5 to 13 inches. The construction of the model seeks to blend strength and stability with a lightweight frame to allow for ease of maneuvering, however they only manage to achieve the second one of these objectives. The Liftmaster has far more reports of breakage than the Torin, and even instances of hydraulic fluid leak. Considering it has all these issues at a higher cost, things aren’t looking good. If you *want* (though why would you?) a trolley jack with poor reviews, you might as well ditch this and go for the Torin, since that’s cheaper, not as poorly rated and has more features. This thing really has no benefits going for it, and should be avoided completely. Car jacks come in some many shapes and sizes precisely because various types of cars all require different jacks. Because of this, the views expressed in these reviews are only as good as long as you can relate them to your particular situation, which is why we highlighted in some summaries that a given jack may be the best option depending on your car even if it isn’t our number 1 pick. Remember to always contextualize first and compare features second.